If the Planning Commission votes to approve the zoning, the applicant will move forward in the process to the next two public hearing by the full County Commission (August 17 and October 26). If the Planning Commission votes against the proposal, the developer is likely to withdraw the application as was done the last two attempts. Seldom will the County Commission approve zoning changes that are not approved by the Planning Commission. This is why letters, emails and appearances at the Planning Commission is so important. The Developers meeting on July 18is not an official meeting or requirement of the rezoning process. Input and discussing is not on record. The developer will host the meeting with refreshments and attempt to sell the project. The developer can not be held accountable for what may be promised unless it is in the application or they go on record with the promise at the public hearing which is recorded and transcribed. That is the 4 dates of importance for this process. Hopefully it will end with the Planning Commission vote. Please email the planning commission and plan on attending the public hearing on July 24th at 5:30pm, County Center. No action has been taken at this time. Next step will be public notice, signs posted at property, public hearing and the vote. Then we get 31 homes or 131 homes. Contactdavidboyett@aol.com for questions or discussion. 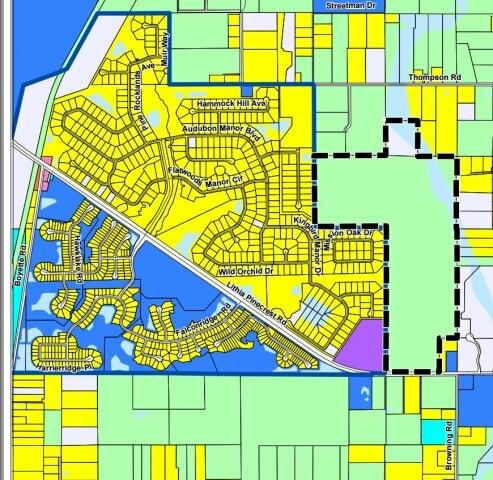 A rezoning request has been filed by the property owners, Pinecrest Land Company of Mokena, IL, to build 164 homes adjacent to FHT from the property lines behind Keeler Oak St, Mission Oak Dr. and Burnt Oak Ln. The development will have a single entry/exit on Lithia Pinecrest Rd. The land is currently zoned Agricultural Rural and restricted to 32 homes on 5 acre lots. This is the third attempt by the owners to rezone the property to Residential so they can build more homes. Community protest has been instrumental in keeping the property rural. Concerns have been mailed, emailed and presented in person at the past two hearings. The most recent hearing was in 2013. Most concerns focused on urban sprawl, traffic, schools, public safety, water resources and habitat. Telephone: (813) 272-5940 Address: 601 E Kennedy Blvd, 18th floor, Tampa, FL, 33602. Monday,July 24,2017 at 5:30 p.m.
Where: Planning Commission Board Room,18th Floor of the County Center Building located at 601 E.Kennedy Boulevard, Tampa,Florida 33602. The proposed amendment is intended to change the land use on 164± acres from Agricultural Rural- 1/5 (AR-1/5) to Residential-1(RES-1). The AR-1/5 category permits a maximum density of one (1) dwelling unit (du) per five (5) acres and a 0.25 FAR or a maximum of 40,000 square feet (sq. ft.) of non-residential uses. The Residential-1 category permits a maximum of one (1) dwelling unit (du) per acre and a 0.25 FAR or maximum of 30,000 square feet (sq. ft.) of non-residential uses. Currently, up to 32 units can be built on the site under the (AR-1/5) category. The proposed amendment would allow an additional 132 dwelling units for a total of 164 dwelling units on the subject property and a reduction of 10,000 square feet of non-residential uses, subject to Locational Criteria.